When you envision a pillow fight, down and feather pillows are what likely come to mind. These pillows as well as their alternative counterparts have made a name for themselves for being soft and fluffy. If we are being honest with ourselves, a soft, fluffy yet supportive pillow is something almost all of us long for. Just like with any other pillow types, these pillows are not without their short comings. However, whether one derives satisfaction or not from these pillows is a highly subjective and personal matter. There are numerous factors to be considered before you arrive at a suitable and functional pillow for your needs. This guide has, therefore, been put together to help guide you on how to successfully purchase the best down, feather, and alternative pillow for your needs. Must Read: Before You Go! Down pillows make use of down clusters rather than feathers. Down clusters are derived from goose or duck plumage that is situated beneath the feathers of these birds. The cluster unlike the feather lacks a quill and thus is softer and fluffier. Their supportive capabilities are comparable to those of feather pillows but they have been found to outlast the latter. Since they lack a quill, they do not degenerate. They are also easier to mold as needed. Goose down clusters, like the feathers, are larger than their duck counterparts. Goose down pillows are, therefore, more sort after and more expensive than the duck downs. The down side to these pillows is that they tend to lose their supportive abilities over time and will require you to fluff them ever so often in order to improve their support. Like the feather pillows, down pillows are not hypoallergenic; a feature that is often a deal breaker for people with sensitive respiratory systems. Feather pillows make use of duck or goose feathers. These are preferred as pillow filler materials as they are soft and can easily be fluffed. The feathers used as pillow filling are usually derived either from the wings or tails of geese or ducks. Goose feathers are larger and somewhat softer than duck feathers. Due to their larger size, these pillows also provide better support. It, therefore, comes as no surprise that people will prefer goose to duck feather pillows. The down side to feather pillows is that not only do they lose their supportive capabilities with time, the quills of the feathers (the midrib if you will) tend to stick poke through the covers and might result in uncomfortable sleep. They also tend to lose their loft over time. This is due to the breaking of the quills as you wash and dry them. Another deal breaker for some people is the fact that the feathers can aggravate allergies making it rather difficult to breathe as they sleep. Down alternative pillows are designed to provide the same softness that one gets from using a down or feather pillow only without the allergy and lack of supportiveness. To achieve this, instead of using feathers or own clusters, these pillows use a polyester micro fibre or ‘puff’ fibres. They are said to be hypoallergenic than their down and feather counterparts. Since the filler material is not derived from actual birds, these pillows are likely to appeal to those who are sensitive to animal rights and needs as well as vegans. They are also more breathable than down and feather pillows and may therefore be suitable for use in hot weather. They are also preferred over down and feather pillows due to their affordability in comparison to the latter. Down and feather pillows have, however, been found to outlast these pillows. They are viewed by some to be less on the eco-friendly side due to the reliance on petroleum for their production. The choice between these pillows is a highly personal one. It is dependent not only on your purchasing power but on other personal tastes and preferences. Down alternative pillows are best suited for people seeking the cloud-like feeling of sleeping on an actual down pillow but do not have the purchasing power to buy a Hungarian down pillow. They are also suited for people with a sensitive respiratory system due to their hypoallergenic properties. Vegan users and animal lovers are also likely to find these pillows as a suitable fit for them. Down and feather pillows attract more or less a similar crowd. These pillows are best suited for people to whom softness and fluffiness of a pillow is a must have quality. Due to their price points they are likely to attract buyers with a high purchasing power. Down pillows are, however, more affordable than their feather counterparts. In both pillow categories, the goose options are more costly when compared to the duck options. Down-feather blend suits best to people looking for a combination of comfort, support and a natural pillow. These pillows make use of both down and feathers to improve on their softness, supportive capabilities and overall durability. The feathers give them that added loft while the down adds the extra fluffiness that is needed. Just like the pure down or pure feather, these pillows are not hypoallergenic. This feature may, therefore be a deal breaker for people with respiratory problems as they may make it even harder for them to breath as they sleep. A common characteristic of all the above pillow types is the fact that they tend to lose their supportive capabilities over time. This coupled with the fact that they are initially designed with soft and fluffiness in mind, these pillows are likely to be unsuitable for people looking for pain relief in their pillows. They may, therefore, not be a good match for people suffering from chronic neck, shoulder and or back pains. 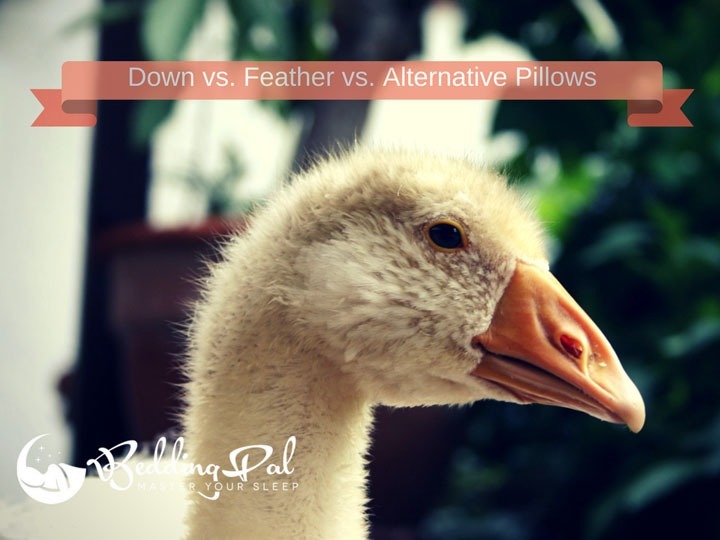 Despite the differences in filler material, there are some common factors to look out for when purchasing either a down, feather or a down alternative pillow. Firmness: The firmness of a pillow is a determinant of its support. The rule of thumb when it comes to pillow firmness is that the firmer the pillow the more the support. There are, however, exceptions to the rule. A pillow that is too firm while giving you the support that you need may result in neck and shoulder pains and uncomfortable sleep. The softness of these pillows places them in the medium-soft category. This means that they strive to strike a delicate balance between softness and support. Size: The size of the pillow is a determinant of the comfort derived from it. It should be matched not only to the available bed space but to the size and weight of the user as well. Typically the smaller you are the smaller the pillow to be used. Also, the smaller the available bed space the smaller the pillow. Down, feather and down alternative pillows often come in a number of sizes ranging from the standard sized bed pillow to a king-sized pillow. Sleeping Position: How you sleep will have a great influence on the type of pillow you settle on and the comfort derived from it. Your sleeping position will inform both the size and firmness of the pillow that you choose. Side sleepers will tend to go for a pillow with a higher loft than back sleepers who need a higher loft than stomach sleepers. Cover Material: The material of choice for the cover coupled with the thread count will determine the pillow’s comfort in a number of ways. When it comes to feather pillows, a higher thread count is best suited to keep the quills from poking out and poking you as you sleep. Cotton fabrics are best suited as cover materials of choice. This is due to their breathability and comfort. Feather and down pillows that tend to retain heat can, therefore, benefit from the cooling properties attached to a cotton cover. Ease Of Maintenance: Apart from being easy to use, your pillow of choice should also be easy to maintain. Consider the ease of cleaning a pillow before purchasing it. Make sure that your pillow of choice can be conveniently cleaned and maintained without damaging it. Feather pillows are generally more difficult to maintain than down and down alternative pillows. For you to maintain them for longer, you might need to rely on professional help to do the cleaning for you. This may prove to be a time consuming and costly affair. Quality: The quality of the pillow directly influences its longevity. To determine quality, consider first the filler material used. Is it feathers, down, a blend of the two, or down alternative? Is it goose feather/ down or is it duck feather/ down? What is the quality of the polyester micro fibre in the down alternative? Answers to these questions will help guide you to a high quality pillow. Also consider the warranty period offered on the pillow. The longer it is the more likely that you will get the most out of your pillow. The brand reputation of a pillow is also an indicator of quality. Therefore, seek out well known brands of good repute. Cost: Pillows are a comfort that we cannot do without. However, this is no excuse to break yourself trying to buy the most expensive pillow there is. A high price tag does not necessarily mean superior comfort. Determine the maximum amount you are willing to spend on your pillow and use this as a starting point. Within every price range there are bound to be comfortable and durable pillows. Down pillows are hailed for their comfort. Do a quick internet search on the best down pillows on the market today and you are bound to be met with an unfathomable number of options. Different manufacturers all claim to have the best product in the market. This short review of five of the best rated down pillows is an attempt to reduce the confusion you are likely to face when looking to purchase the best down pillow. Goose down is generally fluffier and softer than duck down. The use of pur, premium white goose down is the reason why the Continental Bedding 100% premium white goose down luxury pillow is included in this review. Thanks to the filler material of choice, this pillow has been found to be rather comfortable. It has a fill power of 550 and makes use of 27 ounces of goose down in order to achieve its superior comfort. The manufacturers make use of a pure cotton cover in order to add to the pillow’s comfort and breathability. The cotton outer cover has a thread count of 233. The pillow measures 20 inches in length and 30 inches in width. Pillows are a source of comfort as well as a stylish addition to one’s home. The Royal Bedding luxury down pillow provides its users with the much needed comfort all the while having a stylish edge to it. The stylish appeal is derived from the cotton cover with a silky piping detail that comes with the pillow. The comfort aspect of the pillow is derived from the cotton outer cover and the use of a predominantly goose down as the filler material of choice. While identified as a goose down pillow, this pillow is essentially a down-feather blend. The feather portion of this blend is a mere 10% while the goose down accounts for the remaining 90%. It has a fill power of 750, an indication of its superior supportive capabilities. The pillow measures 20 inches in length and 28 inches in width and comes in pairs. One can only maintain a clean pillow by dry cleaning it. Continental Bedding is a brand that is associated with the production of superior quality and comfortable products. Like its earlier reviewed counterpart, this pillow has been included in this review due to its superior quality and comfort. Apart from being comfortable, this pillow is rather effective at providing the much needed head and neck support. Thanks to its fill power of 700, this pillow is ideal for use by side sleepers who require that extra support and comfort. Back sleepers may also find it to be rather comfortable. It is filled with pure Hungarian down. For this reason this pillow is rather pricey compared to its counterparts. To add to the comfort and stylish appeal of this pillow, manufacturers make use of a stripped cotton cover. This white cover boasts of a thread count of 300 and weighs 29 ounces. Like its luxury counterpart, the Royal Hotel’s Down Pillow is known for its comfort. It is for this reason that it has been included in this review. This pillow is capable of providing comfort and support to its users. Side sleepers are, therefore, likely to find this pillow to be a useful sleeping companion. It comes in three sizes; standard size, queen and king sizes. These pillows also come in pairs. This way, you don’t have to worry about your spouse or partner stealing your pillow from you. Due to its quality, this pillow has received a five star rating from a number of shopper guided reviews. While it is essentially a down and feather mixture, the down accounts for 90% of the fill and the feathers comprising the remaining 10%. The cotton cover of this pillow has a 500+ thread count. This not only keeps the down in, but helps to make the pillow much more comfortable. Another plus of the Royal Hotel’s Down Pillow is that it is hypoallergenic. It may, therefore, be beneficial for people with sensitive respiratory systems. The Original Queen Anne pillow is a product of the Queen Anne Pillow Company. This family owned and run company has been in existence since 2010 and has made a name for itself where quality is concerned. This particular pillow is included in this guide due to its comfort and quality. This pillow comes in the standard, queen and king sizes and has a fill power of 650. One can always choose the desired firmness by choosing between the 24, 26, or 28 ounces pillows. The pillow fill comprises of 80% down and 20% micro feathers. The 230 thread count of the cotton outer cover helps to make this pillow both breathable and comfortable. Due to the options in weight and firmness, this pillow is compatible with side as well as back sleeping. Feather pillows like down pillows are preferred for their comfort factor. They have also been found to be more supportive than their down counterparts. Due to the search for comfort, feather pillows have gained popularity. With numerous options being available in the market today, how then do you tell the difference between the best Feather pillows and those of poor quality? L LOVSOUL Bedding has been manufacturing feather/down beddings for 18 years. In that period, they have made a name for themselves for providing quality products. Their goose feather bed pillow is included in this review due to its ability to provide comfort to its users. It makes use of a pure cotton outer covering that gives this pillow its hypoallergenic properties. The use of goose feathers gives this pillows the desired firmness and thus gives it the ability to provide adequate support to its users. To add to the comfort of the goose feathers, the manufacturers have added a micro fibre chamber. It also comes with a pure Egyptian cotton cover that makes the pillow rather breathable.These pillows are compatible with back and side sleeping. The Beckham Hotel Collection Luxury White Down Feather Pillow has made a name for itself in the beddings industry as a comfortable sleeping companion. It is for this reason that it has been featured in this guide. It combines the comfort attributes of feather, down alternative, down and gel fibre to achieve that soft and comfortable effect it is hailed for. What’s more, the cover that holds all these components in place is made from pure breathable cotton. This not only helps the pillow to be comfortable but makes it moisture absorbent and breathable. The end result is a cool, comfortable pillow. Another plus of these pillows is they are hypoallergenic. They may, therefore, be suitable for use by people with sensitive respiratory issues. To ensure that users get the best quality there is, the pillows are Responsible Down Standard (RSD) certified. The Original Firm Feather Pillow by Down & Feather Co. is considered to be one of the best feather pillows in the market. This can be attributed to the quality of the feathers used as well as the pillow’s covering material. The filler material of choice for this pillow is pure Hungarian goose feathers while the outer covering is made from pure cotton. Since goose feathers are larger and denser than duck, this pillow is well suited to provide adequate support to the head and neck while still remaining soft and comfortable. It is, therefore, compatible with any sleeping position. Depending on your preferred sleeping position, you can choose the soft, medium or firm option of this pillow. Users also have the option of having the firmness customized to a desired height or firmness upon purchase. This way you have just the right pillow for your needs. The pillow is also easily molded and has hypoallergenic properties. It comes with a 30-day money back guarantee and a 10-year warranty period. The Sweet Jojo White Goose Feather and Goose Down Pillows have earned a spot in this guide due to their ability to provide comfort on a budget. These fairly priced yet comfortable pillows are filled with 95% goose feathers with the remaining 5% being goose down. The combination of goose feathers and goose down gives the pillows a medium firmness which in turn makes the pillow comfortable for both side and back sleepers. They can also be used to support your back as you read or work while seated in an upright position. The pure cotton cover with a 240 thread count also adds to the pillow’s softness and breathability. The result is a pillow that stays relatively cool as you sleep allowing you to achieve sound and uninterrupted sleep. The puredown Down Feather Pillows have been included in this guide due to their comfort and style attributes. While the primary purpose of the pillow is to offer support to the head and neck to allow for proper spinal alignment, it plays an aesthetic role too. Your choice of pillow can add that much needed edge to your bedroom. These particular pillows are filled almost entirely with goose feathers that are safely held together by a pure cotton outer covering. The outer cotton covering comes in twos. This double layer of fabric is meant to keep the feathers in. You therefore do not encounter the discomfort that is being pocket by errant quills as you sleep. To make it easy to maintain, the pillows have been designed to be fully machine wash friendly. This coupled with their hypoallergenic properties make them ideal for people with respiratory issues. Down, feather, and down-feather mixtures are comfortable pillows but they also tend to be rather pricey for most people. This gap resulting from the purchasing power of different customers has led to the introduction of the down alternative pillows into the market. Since the demand for comfortable yet affordable pillows is high, you are bound to meet a wide array of down alternative options. We have complied a review of three of the best down alternative pillows in the market today. The MASTERTEX Down Alternative Pillow has earned a place in this guide due to its supportive design that allows you to support your head and neck and improve your posture as you sleep. The manufacturers make use of a gusset design that allows the pillow to mold to the natural contours of your head and neck. The filler material of choice for this pillow is pure micro fibre. This filler material allows the pillow to adequately support your head and neck even as you move about in your sleep. The pillow’s outer pure cotton covering not only lends the pillow a comfortable appeal but an aesthetic one too. It has a jacquard pattern that resembles a grid-like window pane. It also has a 300 thread count that makes the pillow rather comfortable to sleep on. To make it easy to carry and store, this pillow comes with a clear plastic carrying case. It can be machine washed and dried. This makes it easy to maintain. Lastly, this pillow comes with a one-year warranty. This pillow has been included in this review due to its affordability and comfort. Much like its standard sized counterpart reviewed above, this pillow has made a name for itself for providing adequate support to users while still ensuring they stay comfortable enough to have a good night’s sleep. It is filled entirely with microfiber that is encased in a pure cotton fabric outer cover. Its gusseted design allows for maximum support provision even as users shift positions in their sleep. The medium loft of this pillow allows it to be used comfortably by back as well as side sleepers. To make it easy to use and maintain, this pillow comes in a clear carrying case that can later be used for storage purposes. It is also wholly machine washable and drier friendly and comes with a one year warranty. The SmartHome Bedding Hotel Collection Plush Pillow is included in this guide due to its durability and comfort. These are key features to look out for when purchasing any pillow. Since this is a rather long-term investment, you want a pillow that will serve you for a long time. That way you get the most out of your purchase. The filler material of choice for this pillow is 25 ounces of polyester micro fibre. The outer casing of the pillow is a half and half blend of cotton and polyester. The cotton half lends comfort and breathability to this pillow while the polyester half lends durability to the pillow. To make them easy to clean, these pillows can be washed in a washing machine and dried in a drier on the low setting. Down pillows, feather pillows and their respective down and feather blends are renowned for their comfortable yet supportive capabilities. These pillows are, however, considered by some to be rather pricey and thus their comfort may seem out of reach. To remedy this, manufacturers in the pillow industry have come up with down alternative pillows. These provide an equal amount of comfort at a much more pocket friendly price tag. The choice between these three types of pillows will largely depend on individual needs. Down alternatives have been found to be compatible with people who suffer respiratory issues due to their hypoallergenic properties. There are, however, a number of considerations that need to be made before purchasing any of these pillow. We hope the tips provided in this guide prove useful in finding the best down, feather, down-feather, and, or, down alternative pillow for you. If you are looking for more options, check our guide to best pillows. I am a big advocate that having a great sleep is something everyone deserves. With over 10 years of experience in this field, I would love to use this platform as a means to help you achieve a good night sleep. Smart Nora Reviews: Is This The Best Anti Snoring Solution In 2019? Looking For Best Pillows for Your Needs? Here’s How To Choose One.